If you could stand side-by-side at a mirror with one of your distant ancestors, one thing you might notice is that your mouth is a whole lot smaller than theirs. 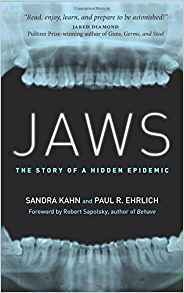 The question of why is at the heart of a new book by orthodontist Sandra Kahn and biologist Paul R. Ehrlich, Jaws: The Story of a Hidden Epidemic. When we look at the skulls of ancient hunter-gathers, we can see that they had strong jawbones large enough to comfortably accommodate all 32 teeth, including the third molars – “wisdom teeth” – that give so many of us trouble today. Crooked or misaligned teeth are rare; likewise, impacted wisdom teeth. While Dr. Weston Price persuasively argued that such problems arose with the shift from traditional to modern diets, Kahn and Ehrlich suggest that it wasn’t merely a matter of nutritional intake. Something else happened as refined sugar and white flour came to dominate many a diet. Our food became even softer than it had after the advent of cooking. As a result, our jaws just don’t receive the workout they once did, when most food was tougher and required more chewing to eat and digest. The lack of stimulation, especially during childhood, results in underdeveloped jaws. Underdeveloped jaws mean that there’s not room enough to comfortably house the teeth and tongue. Simultaneously, the authors note, we’ve seen a rise in other factors that contribute to poor oral posture, such as mouth breathing and bottle-feeding instead of breastfeeding. Proper oral posture for the mouth at rest is when the upper and lower teeth gently touch and the tongue rests firmly against the roof of the mouth. Poor oral posture contributes to a receding lower jaw, which in turn causes the tongue to sit too far back in the mouth. This obstructs the airway, interfering with proper breathing. In the worst cases, this can result in obstructive sleep apnea (OSA) as the airway is fully blocked repeatedly through the night, restricting the supply of oxygen to the body and brain. OSA, in turn, has been linked with a broad range of systemic health issues, including heart disease, diabetes, stroke, and cognitive impairment. While there are other reasons why one might develop OSA, Jaws reminds that we shouldn’t overlook the teeth as a potential factor. When they are, there are a number of therapies that may be of help for both the dental situation and the health effects that follow, from myofunctional therapy to laser therapy; oral appliance therapy to surgery. Breastfeed for at least the first year, exclusively for six months if possible. And avoid pacifiers until weaning is complete. Wean onto foods that require chewing. Pay attention to the toughness of foods, and encourage thorough chewing. Teach your kids to keep their mouths closed when not talking or eating. Check your children’s sleep habits, looking for mouth breathing or signs of disturbed slumber. If you notice anything, consult both their physician and dentist. Encourage good posture, avoiding slouching and head-forward positions such as bending over a tablet or smartphone. While following such tips offers no guarantees, it can – along with good nutrition, home hygiene, and other healthful habits – help lay the foundation for good oral and systemic health into the future.